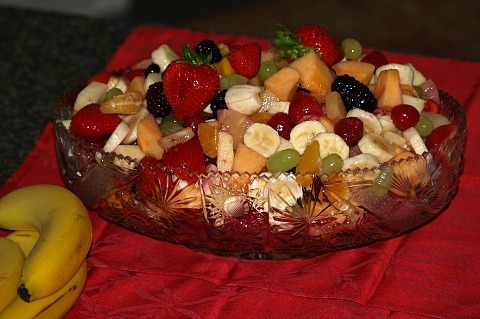 Learn how to make a fruit salad recipe that can be served as a light dessert following a heavy meal or as a snack anytime of the day. They can be fairly light also in calories but some of the recipes are calorie laden with the many added ingredients. Ingredients (which I like to include) like whipped cream, cream cheese or grated cheese, marshmallows, nuts and others make these salads sooo delicious and certainly not for “calorie counters”. When you learn how to make fruit salad recipes, they might be as simple as chopping and blending two or three fresh fruits. Today we have an endless selection of fresh fruits in our markets but also unlimited selection of canned fruits. This makes it possible to create wonderful fruit salad recipes. These fruits can be blended with vinaigrettes, creamy dressings or served without. Another ingredient very popular to used are the gelatins, both flavored and unflavored. Gelatin makes some wonderful molded salads which make beautiful presentations to end a meal. Dad learned how to make a fruit salad recipe; it was the best ever. No matter how hard we try, we just cannot duplicate his mixed fruit salad. I think maybe it was the “heart” that he put into making it. My nephew, Mike and I along with all the other family members still talk about Dads fruit salad. Dad wanted every fruit imaginable in his fruit salad. He started by gathering in all the fresh fruits that he could find. After that he went to the canned fruits until he had enough. I know all this fruit makes a huge bowl full but he always made it for our get-togethers so we didn’t have to worry about having too much. There was never a recipe but the following is a list of what could have gone into it. Combine all fruit in a large bowl and mix well. Cover and refrigerate to blend flavor. The following fruit salad is delicious served scooped on fresh lettuce leaves or served frozen. Combine the peaches, pineapple, cherries and lemon juice; toss together to blend. Cream the cheese and mayonnaise together until smooth. Beat the whipping cream until stiff. Combine the dressing ingredients; cook and stir over medium heat until thick and smooth; cool completely. When cold fold in the whipped cream. Combine all the salad ingredients and fold in the cold cream mixture. Let set in refrigerator for 24 hours to blend flavor. Dissolve lemon gelatin in 1 ¼ cups boiling water. Combine gelatin, half and half, vanilla, powdered sugar and cream cheese in blender. Process mixture in blender until smooth and well blended. Pour mixture into oiled ring mold; chill until firm. Dissolve black raspberry gelatin in 3 cups boiling water. Stir drained blueberries into gelatin; pour mixture on top of molded lemon gelatin mixture. Chill until firm; invert onto serving plate and remove mold.